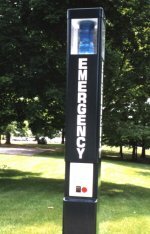 Located throughout the Skidmore College campus are eighteen (18) pole mounted Emergency Blue Light Telephones. Become familiar with their location and use them in the case of an emergency. By depressing the button on the light pole you will have direct access to the Department of Campus Safety. Once activated, the light will flash alerting others to your location.